This entry was posted on July 29, 2013 at 7:52 pm and is filed under Daily Writing. You can follow any responses to this entry through the RSS 2.0 feed. You can leave a response, or trackback from your own site. How sweet! Now I realize what I missed by giving up on my dryer (which broke) this weekend – I should have hung a line instead of getting a new one! Great post. thank you ssm. Hanging clothes is my favorite housework. My youngest swears he will not get married unless he has a drier and a dishwasher. Beautiful!! Tears and chills now. Thanks for sharing. love this. could picture every delightful moment! Thank you Doris. I think Muddy has created her legacy and lived out her purpose. 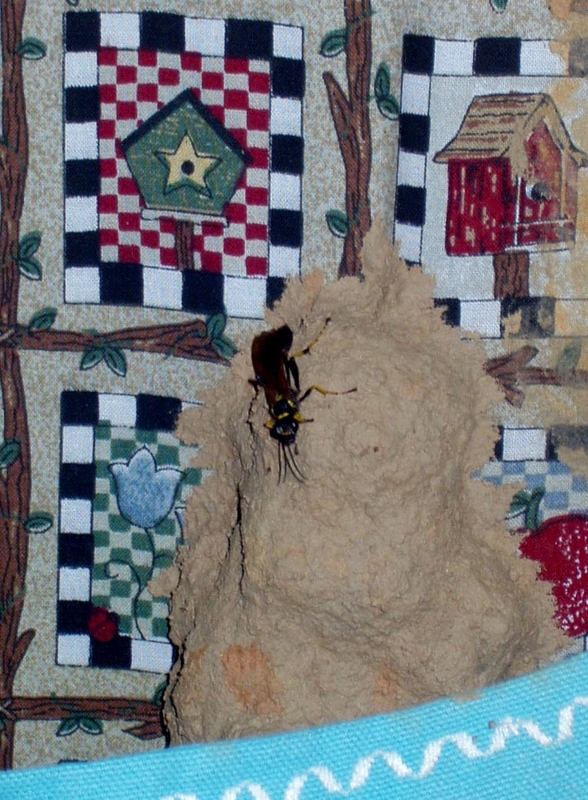 I see little holes in the nest now where I hope baby mud daubers have emerged. Leaving a legacy is so important for all of us, isn’t it? Thank you again for reading my little story. I am SO pleased to come upon your wonderful writings, and didn’t know you wrote, Margaret!! I know you from the old days at Cedars, and the Eden Alternative program. I have an idea I’d like to run by you. Would you email me, please? So glad to hear from you too! Thanks for stopping by and reading. May I come by and see you at work sometime soon? Take you out to lunch? Shouldn’t take long…want to get caught up and explore some ideas. Sure, give me a call and we’ll have lunch. I’d love to catch up.